Democratic legislators hold listening session in Milwaukee and get an earful. Abra Fortson testifies during Saturday’s budget listening session. Photo by Jabril Faraj. State representatives from the Milwaukee Democratic Caucus recently held a listening session at the downtown branch of the Milwaukee Public Library to hear community concerns about Gov. Scott Walker’s latest state budget proposal. The governor’s budget, unveiled early this year, proposes historic spending cuts to education, as well as cuts to health care spending for seniors, the state parks and Department of Natural Resources, and both statewide and local law enforcement, totaling more than $582 million over two years. The budget also seeks to borrow more than $1.5 billion for highway expansion and a new Bucks arena. Taxpayers would see a $5 reduction on property taxes for a median-value home but veterans and unremarried, surviving spouses of veterans would lose $1.14 million in tax credits. The budget also proposes a $2 million cut to business tax credits, which incentivize job creation. Alderman Bob Bauman, whose 4th District encompasses most of the downtown area including the library and the proposed arena site, pitched his solution to a reported $100 million shortfall in funding for a new arena. His proposal would raise the county sales tax 1 percentage point to 6.6 percent, generating $125 million per year in revenue, and also providing funding for the Milwaukee County Transit System, Milwaukee County Parks and local cultural institutions, such as the Milwaukee Public Museum, the performing arts center and Milwaukee Art Museum. Those institutions, which Bauman called “the soul of the city and county,” have struggled over the years with stopgap funding and budget cuts because they lack a dedicated, ongoing funding source. “This is the opportunity to create that dedicated funding source once and for all,” he said. Bauman said the proposal would also address substantial workforce needs by connecting workers to jobs outside the city. A referendum on a similar proposal passed in 2008 with 51 percent of voters in favor but was vetoed by then-County Executive Scott Walker. About 20 people spoke at the session, some waiting more than an hour and many staying for the entire event, even after they had said their piece. Many of the attendees voiced concerns about the cuts to education spending. 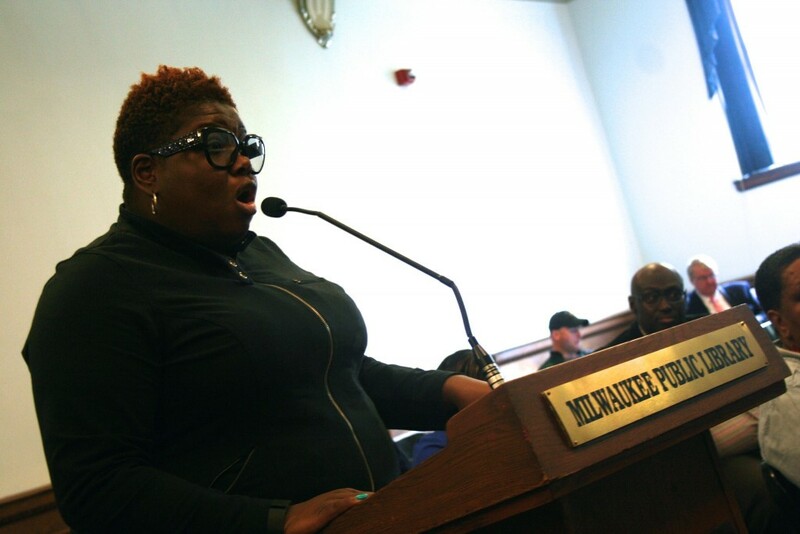 “I just want to understand the logic behind a $127 million cut to public education, a $300 million cut to UW systems and support for the voucher school program,” said Jamaal Smith, education committee chair for the Milwaukee NAACP. Walker’s budget proposes lifting the 1,000-student cap on the 25-year old Parental Choice Program and calls for more than $17 million to accommodate increased participation. The program provides private schools with public money for students in Milwaukee and Racine whose family income is less than 300 percent of the poverty line, or less than $72,696 for a family of four. Statewide, the income cutoff is $44,828 for a family of four. Students in the voucher program have consistently performed worse than students in public schools in both reading and math on state standardized tests. Multiple people also spoke against borrowing for major highway projects while failing to expand transit options. The Wisconsin Department of Transportation is currently conducting 22 major highway projects and 11 studies, which precede projects, as part of its six-year highway development program. Specifically mentioned was the proposed I-94 corridor expansion, estimated at $850 million. In 2014, the State of Wisconsin agreed to pay $13.5 million to settle a lawsuit brought by MICAH and the Black Health Coalition of Wisconsin. The groups alleged the $1.7 billion Zoo Interchange reconstruction amounted to discrimination and would “have the likely effect of exacerbating regional racial segregation” because the project did not include public transit improvements. As a result of the settlement, three new bus routes, which connect to industrial parks in New Berlin, Menomonee Falls and Germantown, were created. Bill Sell, of the Coalition for More Responsible Transportation, supports an alternative proposal to repair the stretch while adding public transit. 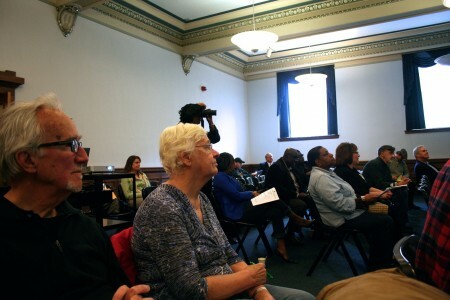 Beyond the concerns raised about particular issues, the session became a forum to vent frustrations about conditions in Milwaukee, particularly for poor and minority communities. The governor’s budget does not address the lack of education, lack of transit options and violence in 53206 — one of the most distressed ZIP codes in Wisconsin — said Cavalier Johnson, who grew up there. “For young people that stay there, for us … gunfire is what lulls us to sleep,” he said. Responding to a change in FoodShare that would make able-bodied adults with no dependents ineligible for benefits, unless working more than 80 hours per month or engaged in the FoodShare Employment and Training Program, MacCanon Brown called for a media blitz to inform people. Authorities are planning to notify people by mail, she said. “Those are positions that we support … but that we need to articulate in writing,” said Goyke of education, transportation and other issues that disproportionately affect the poor. Barnes said the concerns brought up in listening sessions can be used to suggest amendments to the Joint Committee on Finance, currently holding executive sessions on the budget, or in open session. “We want to be able to tell these stories, we want to be able to talk about real life,” Barnes said. George Hinton, CEO of the SDC, said “we have to look deeper” than the issues at hand. He pointed to an area legislator who boasted about the state’s unemployment rate of 4.8 percent in a community “where there’s 50 percent unemployment, especially for men of color.